Where's My Stuff (HazMat Items)? Wheres my stuff, local pickup? CUSTOMER - Retail consumer or agent making online purchase. WARNING: NEVER use any Ammunition unless it is specifically designed for your firearm. Some State Laws still prohibit the possession of Large Capacity Magazines. CUSTOMER is solely responsible for checking your State & Local Laws regarding this matter. CUSTOMER is responsible for paying all cancelation fees associated with ordering prohibited items subsequently canceled by WCArmory. You have no legal restraint which would prohibit you from possessing, ordering, owning, or transferring ammunition. You have never been committed to any mental institution, or been adjudicated as mentally defective. You will not sell ammunition to any minor. Alaska: No sales of Hazmat items due to shipping restrictions. ​State of California: No sales to addresses located in Napa and Yolo counties and the cities of Los Angeles, Oakland and San Francisco. Illinois: The city of Chicago. All Illinois residents must fax us a copy of their FOID card in addition to their State ID. WCArmory is not responsible for honoring any typographical or pricing errors on any products. WCArmory reserves tthe right to cancel any order that contains description and/or pricing errors at any time, at no expense to the customer. Visa, MasterCard, Discover credit and debit cards are accepted. A $20 minimum order total (products and shipping) applies before the credit card payment method is enabled. We do not accept personal checks. Cash and Cashier's Check payments (USPS money orders, certified checks, bank teller checks) accepted, use coupon code "CASH2" to save 2% when paying for your order with a non-credit or non-debit means such as cash or check. Use of coupon code "CASH2" for orders with form of payment other than cash/check/money order will result in cancelation of order. We place holds on funds paid for via by check for a minimum of 3 business days. 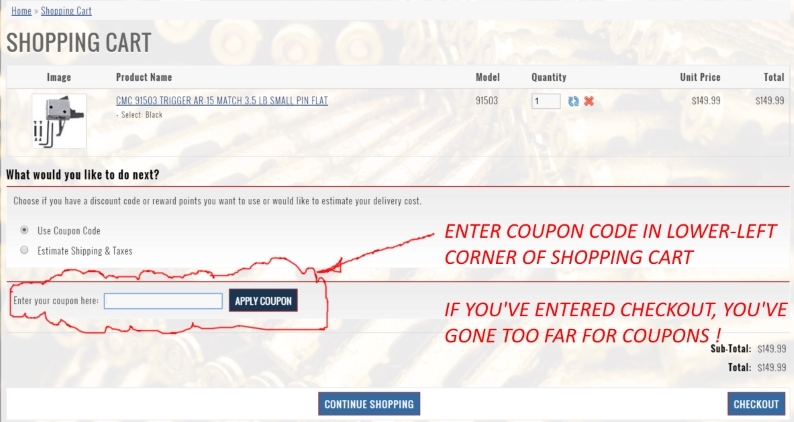 Some coupon codes require that you be logged in to your account to use them. Rather than check out a a guest, please create an account. THEFT. The package and contents will NOT BE covered for theft from the delivery location, once a delivery confirmation has been registered into the online tracking information by the shipping agent such as USPS or UPS. Again, WCArmory's insured shipping methods DO NOT cover theft or incorrect delivery. If you're concerned about theft at your delivery location, pay for a PO box or UPS box or other similarly secure package services. If an insured shipping method is not chosen by the BUYER, WCArmory will ship the items UNINSURED per the BUYER approved shipping method on the BUYER invoice. The BUYER assumes all risks associated with lost, damaged packages. WCArmory is not responsible for the costs associated with lost, damaged, or stolen shipments of uninsured packages. If a buyer selects an INSURED shipping method, the package will be covered for loss and damage during transit. Refunds to purchases that qualify for an insurance adjustment will be made to the original means of payment. Refunds to credit cards take the CUSTOMER's bank a minimum of 7 to 10 business days after WCArmory process the refund, even though the funds are withdrawn from our account by our bank immediately. Parts and Supplies. Where's my stuff? WCArmory ships Monday/Wednesday/Friday. Orders received on Friday will ship the following Monday. Orders received Monday will ship Wednesday. USPS and UPS Ground (Non-HazMat) Shipping. WCArmory is a small company. We pick, bill, pack, ship and deliver our items to the USPS station and the UPS terminal in batches. Our process is manual, and there is typically a 1 to 3 business day handling time to ship on all non-hazmat orders. We typically print shipping labels in the evening and the packages are delivered to the terminals the following afternoon. If you receive a tracking number, it generally won't register with the shipping company for up to 48 hours after the label is printed. Inquiries into shipping status we receive within 5 days after order are not replied to as the package is in handling or delivery to the shipping provider in this timeframe. Local Pickup. WCArmory typically lists items as available on our website as soon as we receive a shipping confirmation from our distributors as we run a couple days behind in picking all orders for local pickup. When you receive a "picked" email from WCArmory with pickup instructions, your order is ready for pickup. Local pickups are available for customers who place orders online. Online orders is the only way we accept sales. WCArmory does not have a storefront. All our products on our website are available for local pickup. Customers select "Local Pickup" as the zero cost shipping method during checkout. Local pickups are made by appointment, only. WCArmory publishes a pickup schedule weekly, which is emailed to the customer after we have picked the order for local pickup. Local pickup times are typically three days a week, 4:45 to 5:00 PM @ 8771 Hall Rd, Utica, MI 48317. Weekend pickups 11:30 to 11:45 AM @ 58757 Van Dyke, Washington, MI 48094 when we don't have a Gun Show. No exceptions to pickup times, no special pickup times. Orders are generally picked within 1-2 days ARO. Orders are not available for same day pickup. Orders not picked up within 1 week after order are canceled. Missed appointments may result in order cancelation, solely at WCArmory's discretion. Orders that WCArmory cancels for missed appointments are exempt from our cancelation fee, except for canceled special orders. A back-order is defined as a product that is out of stock, with no short term resupply from our distributors (3 weeks or less) on the horizon. WCArmory discontinued accepting back-orders effective 3/1/14 for most products that we can't control the delivery or the market price. The discontinued back-order policy includes all Hazmat items (powders and primers). All prices and availability on items and backorders are subject to change without notice. WCArmory can not control the wholesale price of backordered items. WCArmory will notify the customer when chances occur. WCArmory will not honor the original pricing if subject to change. The customer has the right to refuse the order of regular stock items (excludes special orders) upon notice of change by WCArmory. WCArmory enabled a Pre-Order policy for certain items that we can control the delivery and market price of. A pre-order is defined as a retail purchase for an item that is presently out of stock, and the out of stock item is expected to be in-stock based on existing purchase orders with the manufacturer-distributor. If an item on our website is a Pre-Order item, I'll be fairly obvious as noted by the text and description Pre-Order at the beginning of the product information. Furthermore, the only payment method accepted for Pre-Orders is has the words"Pre-Order" in the payment name. Inquiries regarding order status or estimated delivery will not be replied to unless you'd like to cancel your pre-order. If the customer inquires about the estimated delivery time, the order is subject to cancel without warning. PLEASE don't contact us regarding the estimated ship date of a pre-order unless you'd like to cancel that order. If you'd like to cancel an order, reply with the order number and instructions "PLEASE CANCEL"
Repeat PLEASE don't contact us regarding the estimated ship date of a pre-order unless you'd like to cancel that order. If you'd like to cancel an order, reply with the order number and instructions "PLEASE CANCEL". If the customer inquires about the estimated delivery time, the order is subject to cancel without warning. WCArmory does not bill credit cards on pre-orders until the item is shipped. An item is defined as shipped when a label is printed and you receive a tracking number by email. WCArmory will not obtain permission by the customer to fill a pre-order once inventory arrives. If the CUSTOMER no longer wishes to receive a pre-order item, the CUSTOMER may Contact Us to cancel at any time, by email, prior to shipment of the pre-order. WCArmory will acknowledge the cancelation of the pre-order as soon as possible. If you don't receive a confirmation of you request to cancel, please email us again. Requests to cancel a pre-order after a shipping label is printed will result in fees per our Cancelation policy being assessed if the pre-order is canceled. The CUSTOMER may still opt to receive the item without penalty, even after requesting a cancel after a shipping label has been printed.. There is an 8% cancelation charge which applies to all orders that are paid for with a credit card and are requested to be canceled by the customer. WCArmory is assessed a 4% fee to process, and a 4% fee to refund by our credit card merchant service company for voided transactions. This cancelation fee is the responsibility of the customer at the rate of 8% of the total invoice. Pre-Orders that are canceled by the customer early in the pre-order stage, as defined by the Pre-Orders definition, are excluded from the cancelation fee. ALL sales are final and we do not accept returns for refunds or exchange. Additionally, Whitestone Castle Armory (WCArmory) does not accept returns of ammunition, primers or powder for safety reasons. We value our customers and will do all we can to help facilitate the repair or replacement of damaged or defective items. However, WCArmory is not responsible for damaged or defective items. If you have received a damaged or defective item, you must notify us immediately by sending an email through the contact us page with your order number and a description of the problem. Any newly manufactured defective item must be returned to the manufacturer for exchange. In most cases, the manufacturer carries the warranty on these parts and needs to be replaced by the factory as not to void that warranty. Contact the manufacturer first to make arrangements for the return. WCArmory can assist where possible in facilitating merchandise repair/exchange from the manufacturer. Any items damaged during shipping transit will be addressed by WCArmory, for insured shipping methods only. If the BUYER elected to have items shipped, the BUYER assumes all risks associated with lost or damaged merchandise as defined elsewhere in our Terms and Conditions. If you have any questions about a damaged shipment, return and/or exchange, please email info@wcarmory or call 1 (512) 998-6646. If you find an item in stock with another vendor for less, WCArmory would like the opportunity to review. Price Reductions; Prices are fluid and are subject to change. WCArmory will not honor requests to match prices on merchandise already billed in the event WCArmory reduces prices. Price Mistakes; WCArmory makes every attempt to promote accurate quantity and pricing information for the products we sell. Occasionally, however, honest mistakes are made. WCArmory reserves the right to cancel any orders or items in orders that contain price mistakes. WCArmory will contact you regarding partial shipping authorization if an order contains items with price issues. WCArmory makes every attempt to provide the lowest price on every item we sell to ALL of our purchasing public. A 2% discount may be realized by using coupon code "CASH2" and paying for your merchandise with method other than credit or debit. WCArmory is a retail sales company. Dealer (wholesale) pricing requests will not be honored, nor will the acceptance of State Sales Tax certificates. WCArmory's experience is that most request for dealer purchases are for small amounts of product, clearly intended for personal use. Dealers may purchase products at retail prices, including sales tax, then write off the purchase amount including sales tax on YOUR cost of goods purchased forms rather than burden WCArmory with the required record keeping. WCArmory attends gun shows in the Michigan Tri-County area, per our Gun Show Schedule. In the years we've been working the gun show circuit, we've realized a need to develop a TOS specific to gun shows. No show pre-sales to other vendors. During the pre-show, WCArmory is busy unpacking and pricing merchandise. Merchandise is available for purchase after the gun show doors are open. ​No tax exempt sales to other vendors as defined in the Dealer (Wholesale) paragraph of this TOS. Pricing discounts to dealers are solely up to the management of WCArmory. For small purchases of popular items, the retail pricing of a product plus sales tax, applies to the sale price. WCArmory reserves the right to limit and restrict the purchase quantity on any item, at any time, in order to serve all our customers. WCArmory often pays to advertise our attendance at gun shows with a list of our popular in-stock items. WCArmory also has a loyal customer following who pay to get into the gun show, expecting to find us and our reasonably priced items. We make every effort to insure that we have our most desirable items available to our loyal retail purchasing public for the gun shows. WCArmory reserves the right to refuse a sale on any item at any time. Examples; suspected illegal intentions, one-sided low price offers by the purchaser (we are not a flea-shop vendor), rude or argumentative attitude on the part of the purchaser, or disturbing other retail customers during the purchase of items.